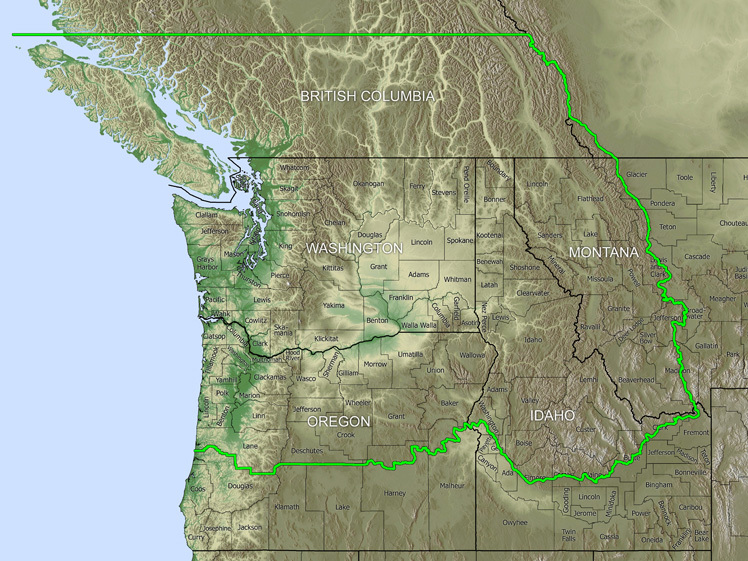 We maintain a boundary similar to the one defined in the 1st Edition of the Flora, comprising all of Washington, the northern half of Oregon, Idaho north of the Snake River Plains, the mountainous portion of western Montana, and southern British Columbia south of about 51° North latitude. Although we more precisely define the placement of this boundary for the purposes of creating maps and determining which species to include or exclude, it should be kept in mind that transitions between floristic regions are generally gradual and any boundary is therefore somewhat arbitrary. A more complete description of the boundary is given below the map. In the 1st Edition, Hitchcock defined the northern boundary to include “an indefinite fringe of southern British Columbia. We place the northern boundary loosely at the 51st parallel, coincident with the northern tip of Vancouver Island and including the majority of shrub-steppe habitats extending up the lower valleys of interior B.C. from the Columbia Basin of Washington. The northern boundary should be considered a very rough guideline; some arctic/boreal taxa that slightly overlap this boundary, especially in the Canadian Rockies, are excluded from treatments. We draw the southern boundary in eastern Oregon and southern Idaho to correspond to the northern boundary of the Intermountain Flora region, which closely agrees with the intent of Hitckcock’s boundary, defined as “the northern half of Oregon (north of approximately the 44th parellel)” and “Idaho north of the Snake River Plains.” In Western Oregon, for simplicity and for the convenience of users in that area, the boundary follows the southern edges of Lane and Deschutes counties even though this introduces a few elements of the Klamath-Siskiyou Flora. The southern boundary is intended to exclude most elements of the Siskiyou, Klamath, and Great Basin floras. Taxa from these floras that barely reach or barely overlap our boundary in Lane and Deschutes counties may be excluded from treatments. Hitchcock defined the eastern boundary to include “the mountainous part of Montana,” a rather vague description that is not strictly followed in the 1st Edition since some taxa from the Beartooth Plateau and adjacent isolated ranges were excluded while some from the Yellowstone Plateau were included. We more narrowly place the eastern boundary to include most of the mountainous portions of western Montana but we exclude the mountains adjacent to Yellowstone National Park (Gallatin and Beartooth ranges, Yellowstone Plateau) and the isolated ranges farther east (e.g., Little Belt and Big Belt Mountains), since these mountains include taxa more characteristic of the southern rockies of Wyoming and Colorado and their lower slopes inevitably include additional elements from the Great Plains Flora. However, taxa from these areas may be included in treatments if deemed relevant (for example, if it is likely they will eventually be found farther within our region).